I'm glad that I got to be with Jason Webley on the Eleventiest Night of All. This blog has brought me many good things over the years, but I'm most glad of the friendships I've made through it I wouldn't have made otherwise, and I would never have known Jason if I hadn't mentioned, here in this blog, back in the dawn of time, how much I liked a video of a song of his called "Eleven Saints". 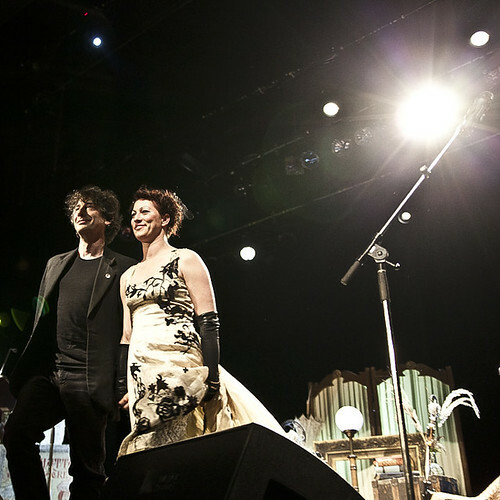 My best friend and I went to your "An Evening With Neil Gaiman and Amanda Palmer" show in Portland on November 8th and it was incredible. The two of you inspired both of us to grow as artists and people. For that, thank you. That said, I was wondering if you could tell me the name of that incredibly creepy song you sang at the end - the one where the disturbed man tells his mother about his killing spree. And how did you find it to begin with? Was it a popular song or something obscure you stumbled onto? It's a song called "Psycho" written by a blind American songwriter named Leon Payne about fifty years ago. I ran across it as one of the extra bonus live tracks on Elvis Costello's Almost Blue album, where he covered the version done by a man named Jack Kittel (which I eventually heard on a collection of songs that Elvis Costello had covered). When I first started going out with Amanda I would teach myself to play songs, which I would play her over the phone, and that was one of them - I think because I liked a version of it that was more lonely and plaintive and crazy and slow than the versions I'd heard. During our drive from LA to San Francisco Jack Kittel's version came on (I'd plugged my phone with much random music on it into the car stereo), and Amanda asked if I'd like to sing "Psycho" to an audience larger than her. And, nervously, I said "maybe..."
I've not seen Tom Stoppard for years (July 2008 in Brazil), so was delighted to learn I'll be sharing a stage with him in Melbourne Australia on December the 16th. Not actually sharing it -- he'll be on it from 7 until 8, and I'll be on it from 9 until 10. But nearly. And if you want to see both of us talk that evening it gets cheaper. Talking of stage-sharing: I mentioned here how much I loved the panel I did with Connie Willis at World Fantasy Con in San Diego. That panel has now been uploaded to YouTube. You can watch it in its entirely. It is Connie and me talking about craft and Where DO We Get Our Ideas and all that for an hour. Let's see. What else? Absolute Sandman Volume 5 came out. And that is most definitely the last Absolute volume of Sandman unless and until I actually write some more. First of all, thanks to you and Amanda for a wonderful concert last week. 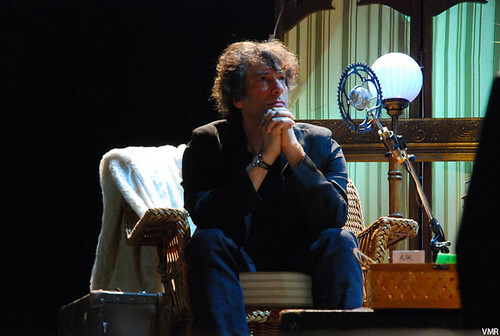 It was really, really marvelous to be there with you. I'm wondering if the recordings of the tour will be available for those of us who didn't get in on the Kickstarter eventually? Second is this: I'm a recently declared English literature major taking an introductory course to British - or, since we also read Beowulf, Anglo-Saxon literature. Although I see you as a very modern writer, and also the type of writer many people who absolutely couldn't ever stand to be an English lit major would read books by, reading the first book of The Faerie Queen I was repeatedly reminded of Stardust, and I know you also did the screenplay for Beowulf. How do you see this type of English tradition in relation to your own writing? Is it a conscious, deliberate, or completely unintended influence? And do you have any advice for me for surviving the rest of the term (Milton, Pope, Blake)? I'm glad you enjoyed it. I'm not sure if the physical CDs will be available beyond the Kickstarter supporters (it'll be a 3 CD pack), but the audio downloads will be available for everyone. How do I see that tradition in relation to my own writing? I don't really think about it much: I love the poets you refer to, mostly (I never liked Alexander Pope's writing as much as I like Pope himself, or at any rate the version of Pope that I read as a boy in the James Branch Cabell Story "A Brown Woman" -- you can read it here, if you're curious). I read it all for pleasure, whether in school libraries or on my own, trying to understand how it all fitted in to the stuff that I already knew that I liked, discovering poets I liked and poets I didn't care for. Advice for surviving it? Lord, I hate to think of good writers as people you should survive. It's why I worry when I'm told I'm being taught in schools and colleges. I'm sure that Thomas Hardy wrote good books, and wish I'd come across them on my own, and all I know is that enforced reading of Thomas Hardy at school left me with a dislike of his books that's visceral, real and undoubtedly unfair. Will you in the near- or slightly-more-distant-future teach a writing workshop? Perhaps. I loved teaching at Clarion, but I also walked away from Clarion with 18 people whose lives and careers I now felt part of in a way that surprised me. I might do it again one day, probably should do, but am in no hurry. It's sad. So many of the old links from the blog are dead. (And many of the images have vanished as well.) But we're in luck here: I checked archive.org and it still had a link to the original story. You can read it here. *Not a true statement. For purposes of humour only. Void where prohibited.